The economic losses from property damage caused by both the April 15th magnitude 7.0 earthquake and April 14th M6.4 earthquakes in Kumamoto Prefecture, Kyushu, Japan are estimated to be up to $3.5 billion by RMS. Risk modelling firm RMS puts the economic loss range as between $2.5 billion and $3.5 billion, which is interestingly where the top-end of fellow risk modeller AIR Worldwide’s $1.7 billion to $2.9 billion (excluding business interruption) insurance and reinsurance industry loss estimate falls. RMS’ economic loss estimate does not include business interruption, shake and landslide-induced damage suffered by infrastructure (roads, highways, bridges, airports, train transport, utilities, dams), or damage to Kumamoto Castle, the risk modeller said. Whatever level the economic loss is estimated at, there is expected to be some reinsurance market impact from this Japan quake event, which could also mean small impacts to ILS funds or reinsurance sidecars. RMS came up with the economic loss estimate after sending a reconnaissance team to the affected area. The estimate is based on findings from the visit, as well as risk modelling analyses of the shaking and its effects in different locations, with modelling carried out using RMS RiskLink version 15.0. The principal areas of damage are to the towns of Nishihara-mura, Minamiaso-mura, and Mashiki-machi. The area has a local river network and hilly terrain where landslides or slope failures were triggered in some locations causing localized pockets of damage. Buildings located up-slope from small landslides were relatively undamaged or suffered light damage, whereas buildings on or beneath affected slopes experienced moderate to complete damage. Nearly all buildings that collapsed or had partially collapsed on the slope or the area beneath it were within close proximity of each other. Evidence of soft story failures (for example in stories with less strength due to extensive glazing, wide doorways or other openings) was observed in some buildings with older construction, in addition to pounding (impacts) between neighboring properties, which caused damage across multiple adjacent buildings. Older mixed-use buildings were seen to have sustained damage or in some cases suffered complete collapse because they were inadequately constructed to withstand lateral (sideways) forces. Older, traditional residential dwellings were found to be particularly susceptible to ground shaking and slope conditions. 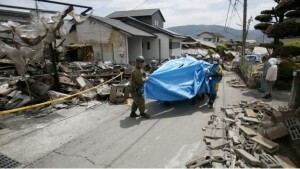 Interestingly, the loss from the 2011 Tohoku earthquake was only thought be around 15% covered by insurance in the end. So, on a percentage basis, this Kumamoto earthquake would need to see a significantly higher proportion of the economic losses estimated by RMS covered by insurance, in order for the toll to insurers and reinsurers to be as high as AIR’s estimate. Of course differences in methodologies, as well as what is deemed in and out of both economic and insured loss estimates makes them very difficult to compare.